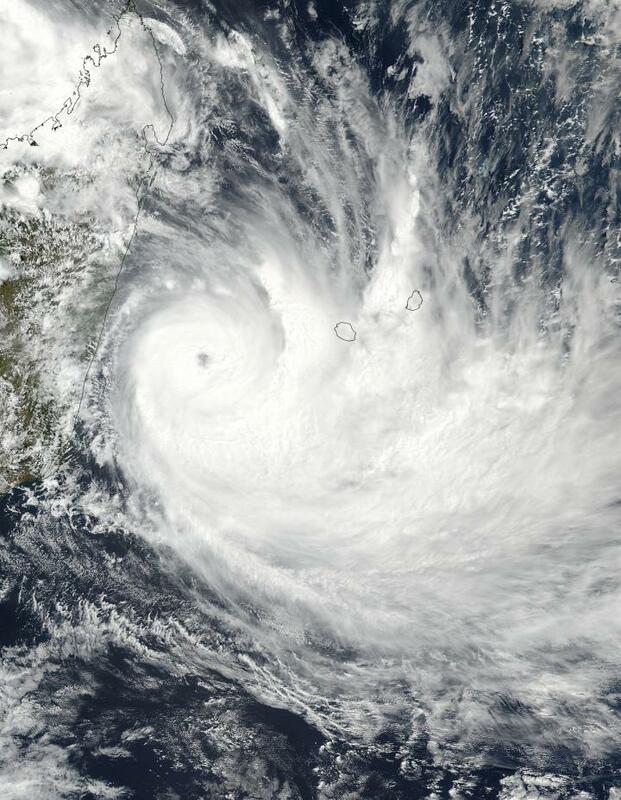 When NASA's Aqua satellite and NASA-NOAA's Suomi NPP satellites passed over Tropical Cyclone Dumazile in the Southern Indian Ocean it measured cloud top temperatures and saw its eye circled by a ring of strong thunderstorms. On March 3, Tropical storm 11S was renamed Tropical Cyclone Dumazile. Since then, the storm has continued to strengthen. On March 5 at 5:12 a.m. EST (10:12 UTC), the Visible Infrared Imaging Radiometer Suite (VIIRS) instrument aboard NASA-NOAA's Suomi NPP satellite provided a visible look at Tropical Cyclone Dumazile off the coast of eastern Madagascar. The VIIRS image revealed an open eye, surrounded by those powerful thunderstorms seen in infrared light from NASA's Aqua satellite on March 6. The image showed Dumazile's eye over open waters and east of the Madagascar coast. A band of thunderstorms stretched over Le Reunion Island. The Atmospheric Infrared Sounder aboard NASA's Aqua satellite captured an infrared image of Dumazile on March 5 at 5:29 a.m. EST (1029 UTC). Powerful thunderstorms with cloud top temperatures as cold as or colder than minus 63 degrees Fahrenheit (minus 53 degrees Celsius) surrounded the eye. Strongest convection was south of the center. Storms with cloud top temperatures that cold have the capability to produce heavy rainfall. On March 6 at 10 a.m. EST (1500 UTC) the Joint Typhoon Warning Center (JTWC) noted that Dumazile had maximum sustained winds near 121 mph (105 knots/194.5 kph). Dumazile was centered near 22.5 degrees south latitude and 52.0 degrees east longitude. That's about 223 nautical miles west-southwest of St. Denis. Dumazile was moving to the south-southeast at 13.8 mph (12 knots/22.2 kph). The Joint Typhoon Warning Center said Dumazile is forecast to continue moving to the southwest and will pull away from Madagascar. Over the next couple of days Dumazile is expected to weaken but maintain hurricane intensity. After two days, the storm will run into cooler waters and increased vertical wind shear that will drop it below hurricane strength.